Remmie has been a part of Missy’s family since she was 7 weeks old (born January 2011). 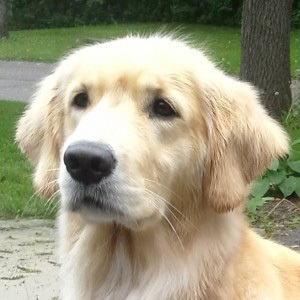 Missy says they had aspirations of doing obedience, agility, and hunting with their beautiful golden retriever. Remmie fell in love with obedience and agility, but soon showed she wasn’t terribly interested in hunting. Unlike most dogs, she seems to prefer snuggling with birds and bunnies rather than chasing them! Her human sister fosters rabbits, and Remmie adores them. Remmie likes to snuggle with them and just generally enjoys lying around watching them be silly. Missy says the family jokes that Remmie doesn’t know she is a dog at all! She is very dedicated to her family, loves all people, and has always approached them gently and respectfully – never jumping or being too rambunctious. Recently, when Missy was home recovering from some medical issues for several weeks, Remmie laid by her feet and would not leave, refusing to even go outside to go potty! People who meet her say she seems to have an “old, gentle soul”. Her approach is soft and kind, and Remmie has patiently helped many people who were once afraid of dogs overcome their fears. While she enjoys most everyone, Missy says Remmie seems to have a special connection with children. The North Star Therapy Animals team once visited a childcare center where some of the children were as young as 9 months. Being completely surrounded by small, crawling, poking children was a new experience for Remmie, and Missy watched her closely as she crouched down to slowly army crawl toward them. Remmie seemed to sense those who were apprehensive and would stop if they seemed afraid. Then, without being asked, she laid on her back so they could approach her. The children loved it, touching and petting her. Remmie was truly enjoying her time, and Missy was touched at how sensitive she was to them. Outside of visits, Missy & Remmie compete in obedience and agility. She also accompanies as the “demo dog” when Missy teaches obedience at Dogworks. In the summer, she camps most weekends with her family. She also loves the dog park, carrying BIG sticks during her walks, and of course – her favorite activity – sleeping!